Last Friday was so much fun! Pupils and staff alike came to school in mufti, putting their best spot forward to raise money for Children in Need. There were colouring competitions, ‘guess the number of spots in the jar’ and even a very heated Duck Staff Sweepstake, which involved almost every member of staff sponsoring their own rubber duckie to take part in the BBC duck race. Come 4pm the staffroom was a buzz of excitement as we all gathered together to watch the race. It was a close heat, but I can reveal that the victorious duck was Mr James Pond, sponsored by our very own Mr Crocker! Congratulations Mr Crocker! 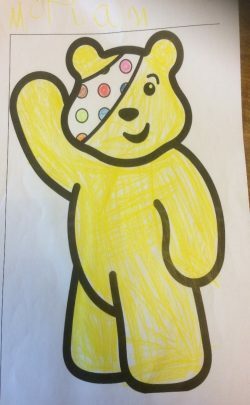 In total, ECS raised a whopping £331.76 for Children in Need. Thank you so much to everyone who took part, and for all the support given by parents and guardians within our community. So now I come to the exciting moment where I can reveal the competition winners! Colouring competition: Miriam from Frogs class. Well done Elliot and Miriam! Colouring competition: Due to late entries, the winner of this competition will be announced in Tuesday’s Hymn Practice!